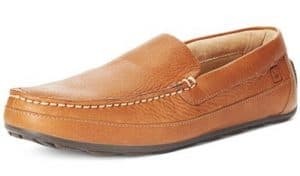 Men’s Loafers and slip-on shoes tend to be some of the most comfortable designs of shoes around; they come in all kinds of styles from casual to dress so that they can be worn with pretty much any type of clothing. The most popular styles include the latest comfort technology that will keep your feet feeling great, whether you are on your feet all day or are just out running errands. The main selling feature of a loafer is that it is easy to get on and off, which makes them a good option for travel or if you have difficulty bending over to tie laces. Slip-on styles of shoes can’t be topped for convenience, and they are also very stylish and on trend. The following are some of the most popular styles for comfortable currently on the market. 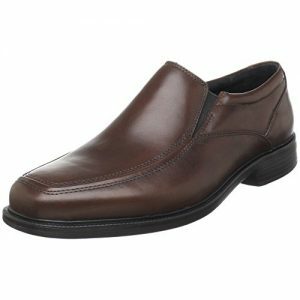 One of the best all-around, top-selling loafers is the Rockport Men’s Style Leader 2 Bike Slip-On Loafer. 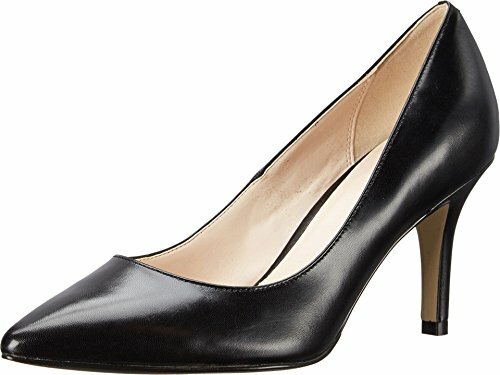 It is a great style that can be dressed up or down, as it works well as a work shoe whether your office is business casual or you need to wear a suit. Rockport is one of the best walking shoe brands due to their excellent shock-absorbing rubber soles. Leader 2 requires no breaking in period and will feel great on your feet as soon as you put them on. As long as you get the right size, they will hold up well when you are walking and not slip off. If they are a little snug when you first get them, you don’t need to worry too much as the leather will stretch out a little bit the more you wear them. The design is bike toed, so that means that there is a seam on each side extending forward towards the toe. Overall, it is a reasonably stylish looking shoe, that is lightweight, flexible, easy to wear, and looks good in different types of situations. 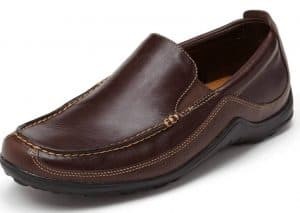 The Bostonian Men’s Mendon Dress Slip-On is a comfy and inexpensive design that is great for those who are always on their feet or busy moving. These shoes are reportedly very durable and should hold up well to frequent wear as long as you spend a little bit of time keeping them clean and polishing them occasionally, as you would with any men’s dress shoe. The Mendon is a good option for formal and business casual wear as they are incredibly lightweight, flexible, look clean and have no logos. They aren’t overly shiny or overly distressed, but instead, they have the right amount of shine for a work shoe. The padding on the Mendon is very cushioned, so they are comfortable to wear for long periods. The only downside is that the grip is minimal and they can be slippery when facing wet or snow like conditions, despite having rubber soles. The Mendon is a high-quality option for the price, that is versatile enough to work well with most men’s wardrobes. Clarks Unstructured Men’s Un. Sheridan Slip-On is a perfect example of the Clarks tradition of high quality, long-lasting shoes. This design is a best seller not only because of the great style, but they also are cushioned in a way that you feel like you are walking on air. Clarks usually don’t have much of a break in period, and the soles are very light for a dress shoe. The Sheridan feature air vents that can help if you have trouble with your feet overheating in leather shoes. It is another design that can be worn with business casual or more formal dress and will work well for either situation. They are comfortable, they look great, and they are easy to get on and off for security when traveling. 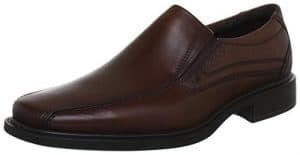 If you love Clarks and are looking for a style that is slightly more casual than the Un.Sheridan, check out Clarks Men’s Escalade Step Slip-On Loafer. 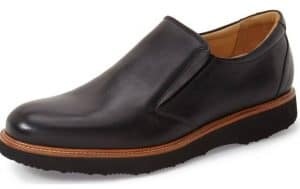 ECCO Men’s New Jersey Slip-On Loafer is one of Ecco’s most popular men’s dress shoes that are perfect for the office. Since they are ECCO, they’re incredibly comfortable and incredibly lightweight. The soles a quiet, lightweight rubber that won’t make any noise when you are walking on a hard floor, even if the bottoms are wet. 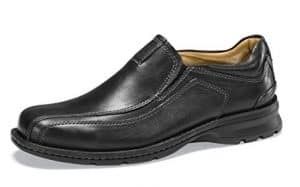 ECCO shoes last forever, and the New Jersey slip-on is no exception as it has the same great quality and excellent workmanship as other ECCO products. Like the different styles listed above, this design goes just as well with jeans as with a suit, and everything in between. The New Jersey Loafer has almost no breaking in period, and they will feel great right out of the box, they are comfortable with no inner seams to rub against your foot. The quality of the leather is excellent, as it is thick premium grade leather. The rubber soles provide great traction even in rain and snow. The high-quality interior lining and insole make the shoe very breathable and won’t cause your feet to sweat. Dockers are usually a pretty good brand for all things business casual, no it isn’t surprising that they have some decent slip-on styles that are great for the office. 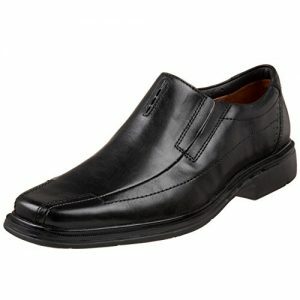 Dockers Men’s Agent Slip-On Loafer are an inexpensive option that offers a good level of comfort. Since these are a budget option, they may not last as long or wear as well as some of the more expensive brands. They are still an excellent style to consider if you are looking for something comfortable, looks modern and is appropriate for the office. If you clean and condition the leather, you can make the shoe last longer especially if it is getting exposed to inclement weather. The Sperry Men’s Hampden Venetian Driver is the most casual looking shoe on our list. This style has a feel that is relatively similar to a slipper, but you can comfortably wear them to the office or out and about. These are a bit too casual to be worn with a suit, but they are great with jeans and khakis. This style has a lot of cushioning for comfort, but they don’t have much in the way of arch support. The soles are very flexible and lightweight. If you don’t like to wear socks with your shoes, Hampden may be a good option for you, as they are comfy enough to be worn with or without socks. Sperry’s are known for their high quality, traction of the sole, and they will usually last for years. Cole Haan ‘Tucker Venetian’ Loafer is just one of the many loafers that Cole Haan offer. If you love penny loafers, Cole Haan is also a great brand to look through. The Tucker Venetian is a good style if you want a shoe that is high quality, but also super comfy. Part of the reason for the comfort of this shoe is that it has a well-padded insole and flexible rubber sole. It comes in your basic brown and black, which are fine for most workplaces. The leather is of high quality, and the shoe itself is very well made and durable. You can slide them on and off easily, and they fit well on most men’s feet. In the picture, they look a little casual, but when they are being worn, they are fine for most offices. The sole has great traction, so you can wear them in inclement weather without worrying about slipping. The Tucker Venetian is another popular choice for travel due to the versatility of the style and the comfort and the fact that they are so easy to wear. 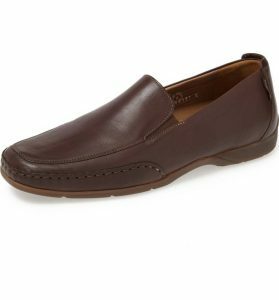 Cole Haan has also introduced a new, more expensive loafer called the Men’s GrandEvølution Venetian Loafer, that uses the same kind of Signature Grand.OS cushioning technology used in the super popular Zerogrand Oxfords that everyone loves. Samuel Hubbard ‘Frequent Traveler’ Slip-On is a fantastic shoe if you are looking to get a style that is a little bit more unique and fashionable. As you can probably tell from the name, this style is built for traveling. It is designed in California and then handcrafted in Portugal using full-grain cowhide leathers. The Samuel Hubbard brand claims to make the world’s most comfortable shoe, and they could very well be right. This style has triple-density memory foam insoles that will conform to the shape of your foot. The insoles are removable if you need to add orthotics. The sole of the Frequent Traveler can be replaced through the companies Resole Program if it wears down. The founder of Samuel Hubbard started the Rockport Shoe company with his father in 1973, so this family has a long history in the shoemaking business. Reviews say the Frequent Traveler is comfortable right away upon first wearing. In person, they are very stylish and sleek with a bit of shine to them. Most men seem to find them comfortable, with a great fit and easy to get on and off. Mephisto is known as a brand that makes very comfortable shoes, and Edlef’ Slip-On is a perfect example of this. They will fit most men well, are comfortable beyond belief and are very stylish. They are a long, streamlined design that can be dressed up or down. In person, they look well made and high quality. Mephisto use something called Soft-Air technology, so they are guaranteed to be super-soft and comfortable, even if you are walking long distances. Mephisto shoes can be somewhat pricey, but they have a reputation for being long-lasting, and there is little to no break in period with this style. The key features of this shoe are the high-quality leather that will mold to your feet, the style that works for both casual and dress situations, and the comfort level. 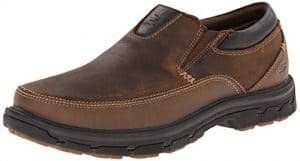 Skechers Men’s Segment The Search Slip-On Loafer is an affordable, office appropriate slip-on that is a little more casual than some of the other options on this list. They are made with an oiled Mohawk leather upper, and it has prominent stitching accents that add a little bit of subtle detailing. It also has a Relaxed Fit® design, so this isn’t intended as a snug fit. It is quite a big shoe with a very rugged shock absorbing sole. The insole is the standard Memory Foam Cushioned comfort insole that Sketchers are known for, and the tread on the bottom is perfect for gripping the ground, even the harsh weather conditions. They can be worn as business casual, but perhaps not a great style if you are looking for a design for more formal wear. Hush Puppies have so many good options for slip-on styles that I had a hard time choosing just one. The Rainmaker(pictured) and the Leverage are both excellent designs if you are looking for a versatile business casual look that could also work with a suit. If you want a more everyday, less formal look, they have a lot of other options available. Hush Puppies are known for the everyday comfort of the brand, so they are well worth a look if you need functional shoes that look and feel suitable for all-day wear. They use a bunch of different types of technologies to help improve the comfort of their shoes; you can find out more about that here.